The first three constitute the three lower realms and the latter three, the three higher realms. Looking at the world around us, and into our own minds, we can see that the six realms definitely do exist. They exist in the way we unconsciously allow our [destructive] emotions to project and crystallize entire realms around us, and to define the style, form, flavour and context of our life in those realms. And they exist also inwardly as the different seeds and tendencies of the various negative emotions within our psychophysical system, always ready to germinate and grow, depending on what influences them and how we choose to live. Most hell beings and pretas live in the earth below the ground. 1-The Hot Hells are located one under another, from the Reviving Hell down to the Hell of Unrelenting Pain, which is 20,000 yojanas below this world. 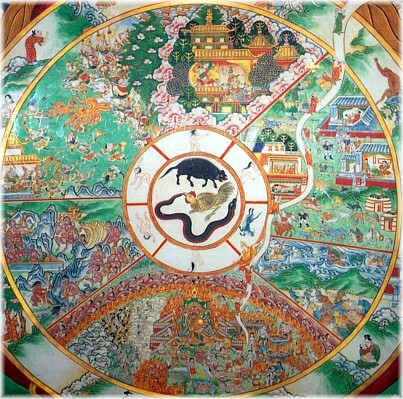 Each is surrounded in the four directions by the four Neighbouring Hells, one after the other. The Cold Hells are also below the ground, one on top of another, in another location. It is said that since the world is an immense gathering of particles, they can all fit. It is often said that the Hot Hells are located below Mount Meru, while the Cold Hells are below Lake Manasarovar. According to the Mahayana though, since the Hell Realms are actually understood to be our own perception, it is not necessary to consider them as definitely existent. 2-Pretas live 500 yojanas below the earth. Beings in the Ephemeral Hells and “pretas who move through space” do not inhabit fixed abodes. They can live below the earth, in the human realm, or other places. 3-Animals either inhabit the great oceans (“Animals living in the depths”), or live mostly on the earth, in water, in trees, in the realms of the gods or humans (“scattered animals”). 4-Demi-gods inhabit cavities inside Mount Meru down to the universal golden basis, some above the water line, some below. The demi-gods living above the water line are sometimes counted as animals and include their chiefs such as Rahu. 5-Human beings dwell on the four continents and the eight subcontinents. 6-As for the gods, there are six abodes of the gods of the Desire Realm. The gods in the Heaven of the Thirty-three live at the top of Mount Meru. The gods in the Abode of the Four Great Kings reside on the four terraces at the top of Mount Meru, just below the Heaven of the Thirty-three, as well as on the crests of the seven mountain ranges, in space and so on. In the sky above the Heaven of the Thirty-three, are the four other abodes of the gods of the Desire Realm, one above the other. Above these, are the Seventeen Heavens of the Form Realm. Though the abodes of the Formless realm, being formless (in other word non-physical), have no separate location, they are also called "celestial worlds". ↑ The Tibetan Book of Living and Dying, pages 116-117. This page was last edited on 18 November 2018, at 09:25.